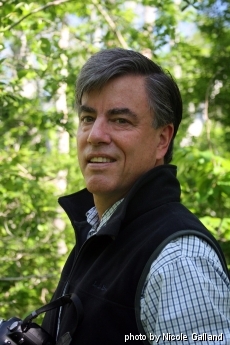 David Foster is an ecologist and author of Thoreau's Country – Journey through a Transformed Landscape (1999), New England Forests Through Time (2000; both Harvard University Press), Forests in Time – The Environmental Consequences of 1000 years of Change in New England (2004; Yale University Press), Wildlands and Woodlands: A Vision for the New England Landscape (2010; Harvard University), Hemlock: A Forest Giant on the Edge (2014; Yale University Press), and A Meeting of Land and Sea: Nature and the Future of Martha's Vineyard (2017; Yale University Press). He has been a faculty member in Organismic and Evolutionary Biology at Harvard since 1983 and Director of the Harvard Forest, the University's 4000-acre ecological laboratory and classroom in central Massachusetts since 1990. David is the Principal Investigator for the Harvard Forest Long Term Ecological Research program, sponsored by the National Science Foundation and involving more than 100 scientists and students investigating the dynamics of New England landscape as a consequence of climate change, human activity, and natural disturbance. David has a Ph.D. in ecology from the University of Minnesota and has conducted studies in the boreal forests of Labrador, Sweden and Norway and the forests of Puerto Rico, the Yucatan, and Patagonia in addition to his primary research on landscape dynamics in New England. His interests focus on understanding the changes in forest ecosystems that result from human and natural disturbance and applying these results to the conservation and management of natural and cultural landscapes. He currently serves on the boards of The Nature Conservancy, The Trustees of Reservations, Choate Rosemary Hall and Highstead Foundation. As part of his conservation work David and colleagues developed Wildlands and Woodlands – A Vision for the New England Landscape, which lays out an ambitious plan for the protection and conservation of forest and farmland across the region. In September 2010 Wildlands and Woodlands received the Charles Eliot Award from the Trustees of Reservations. At Harvard University David teaches courses on forest ecology and environmental change and directs the graduate program in forest biology. He lives in Shutesbury, Massachusetts with his wife Marianne Jorgensen and their children Christian and Ava.